Gone are the days when only tunics or the kamiz’ were given style preference in a Pakistani woman’s wardrobe. Nowadays, it’s the lasting spell of diverse pants which is taking the country’s fashion scene by storm! The variety of pants available currently in the countryis an exciting turn in the fashion sense and a dream come true for fashionistas all over Pakistan. Knotted Pants are one of our top picks for this year. These are a turning point in the local fashion scene as well a fresh start to a straight silhouette and very trendy, which can be dressed up by a party tunic or dressed down by a casual one. They are a step-up to the old Capri pants but definitely with a lot more panache. The second one on our list are the Gharara Pants – an eastern version of the bellbottoms but a notch further and more wearable than its yesteryear version, our favorite pick during the shaadi season. Offering fusions every woman is hoarding nowadays, interestingly; they range from party wear and even weddings. It’s an amalgamation of cultures, and used are the appliquéd lace, silks with trimmings and pearls and even embroidered. 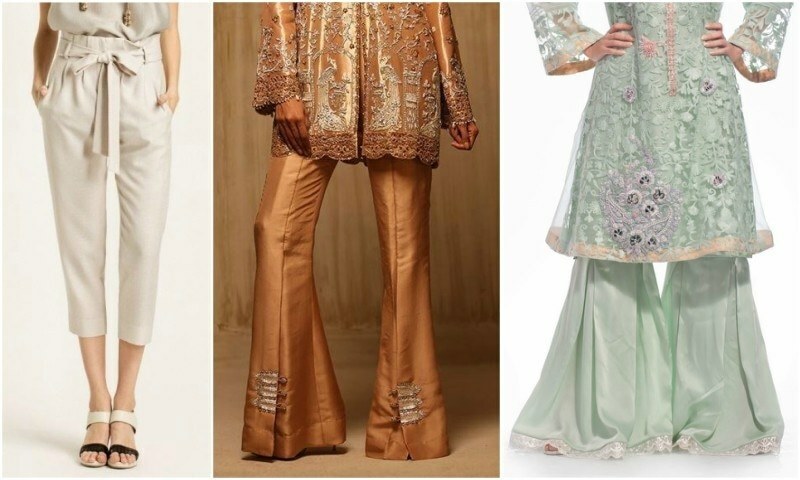 The third preference would definitely go to Bell Bottoms (also called the palazzos); plain ones with a fantastic cut in a pure silk are what every closet should and must have. There are many versions of these versatile pants, they can be wedged with organza strips, embroidered or worked with pearls to give it a more formal look. We come to the Tulip Pants section or the tulip shalwar which has been going strong for the past two years now and still giving some competition to its counterparts. We have seen a wide range of these trousers, namely the pearl and rose tulips, straight, baggy, flared; to name a few in the last few seasons and we still love them. The straight pants and the bootlegs will always be our favorite picks no matter what decade. Some interesting diversities of the straight pants with lace or organza detailing makes it a necessity for every season. The bootleg pants is a close contender to an everyday, go-to styled pants which we think every woman requires in basic colors. 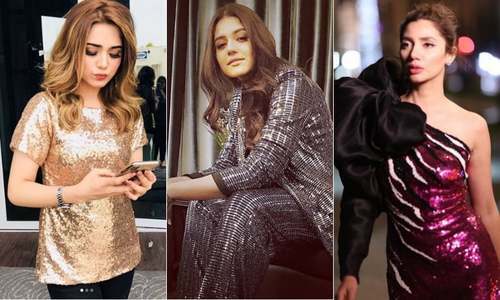 Some of the other styles we have found to be trending are the basic shalwars with trimmings and, or pin-tucks, the dhoti shalwar with, as well as without the ornaments and the latest Turkish cuff shalwar, which we believe is just like a good-old infatuation. Zubia Motiwalla is a prêt and luxury-prêt designer based in Karachi with a penchant of writing. She exclusively contributes to HIP; stay tuned for more.